Cape Iwai (岩井崎) is one of the view spots of Kesennuma. It has a beautiful cape with many unique rocks. When the waves hit the rocks, it splash the water very high. That high splash is one of the main feature of this spot. 1. use BRT to Rikuzenhashikami Station. Cape Iwai is located southern area of Kesennuma. It has many unique scenery of limestones. Those limestones are encroached by the waves. The main feature of this cape is the high splash by the wave. 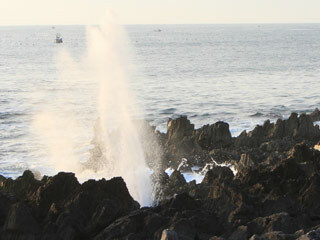 When it is low tide, the wave hit the rocks and splash the water very high.